The most heartening outcome of Prime Minister Manmohan Singh's meeting with Chinese President Hu Jintao in the Chinese holiday resort city of Sanya was that there was a clear understanding to abandon the many irritants that have led to a serious deterioration in relations between the two Asian neighbours in the last 18 months. 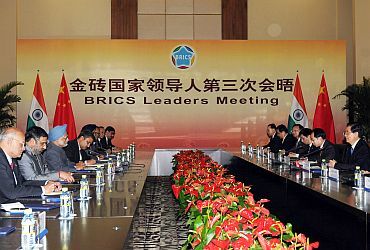 Both India and China now appear pro-active about the future of their relationship, one Indian official present at the meeting told Rediff.com. After the Indian government worked on Wen's proposal -- made during his visit to New Delhi last December -- it felt the 'working mechanism' could further maintain peace and tranquility on the contested India-China border. India and China have had 15 rounds of talks on resolving the contentious border issue, so what will this mechanism achieve? India's National Security Adviser Shiv Shankar Menon, who briefed the media in Sanya on Wednesday evening, said the working mechanism would resolve any differences between the India and Chinese sides on routine issues like border trade, delivery of mail etc. Despite the serious differences, the India-China border, Menon emphasised, was one of the most peaceful in the world. In real terms what this working mechanism will translate into, Rediff.com has learnt, would be that a standing group will be set up soon on the Indian and Chinese sides with the mandate to sort out nitty-gritty issues without taking the byzantine refer-the-matter-to-New-Delhi-Beijing route. Even though the working mechanism is currently only "an agreement in principle," as Menon described it, the standing group could be empowered to meet quickly when issues arise, perhaps even conferring with each other by video conference. Both sides also agreed to set up an India-China exchange in 2011, which will include the visits by leaders (Dr Singh is likely to visit Beijing/Hu, who will step down from office next year, will visit New Delhi, his second passage to India since 1986), the setting up of an economic strategic dialogue soon, people to people contact, and, most important, the resumption of defence exchanges. While Menon was quick to assert that "we never froze defence exchanges" -- pointing out that flag meetings were held at the border, and military commanders on both sides maintained their communication -- the fact is that India cut off defence ties after the Chinese denied a visa last summer to the Indian Army's then Northern Army commander Lieutenant General B S Jaswal, because he served in Jammu and Kashmir, which the Chinese have begun to describe as 'disputed' in recent months. To soothe Indian tempers, the Chinese side proposed on Wednesday that the Indian Army assign a multi-command delegation -- consisting of officers from its different commands, including the Northern Command -- to visit China this year. Assuming that it happens, the Indian defence services and the People's Liberation Army could resume military exercises by next year. Indian diplomats would not confirm if China's decision to issue stapled visas to residents of Arunachal Pradesh and Jammu and Kashmir came up for discussion. But their cryptic refusal to comment on the stapled visas issue or the presence of PLA troops in Pakistan occupied Kashmir -- estimated recently at 11,000 officers and men by one Indian general -- came up for discussion indicates that both matters probably did. One Indian diplomat felt the decision to deny General Jaswal a visa was probably taken at the lower levels of the Chinese establishment, without consulting their superiors. It was, he felt, a decision taken with complete disregard for Indian sensitivities. It is a "huge issue" for us, he added, and the Chinese did not anticipate the magnitude of India's hostile reaction. 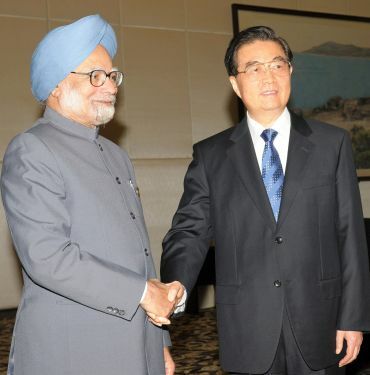 Will the tone set by the Sanya summit -- the 13th time Dr Singh has met President Hu since he became India's prime minister in May 2004 --last or will it evaporate as quickly as the positive mood set by the prime minister's last visit to China in January 2008? An Indian diplomat felt that New Delhi would prefer to wait and watch, but he believed the Chinese have understood the value of India's presence on the United Nations Security Council just four months into India's membership of that body. And though India's candidature for permanent membership of the UNSC did not come up at Wednesday's meeting, the diplomat doubted if China would eventually stand in India's way. If Beijing is an obstacle, the diplomat added, India would have to swerve past it, like water does when confronted by a rock in its way.